Almost every week, in fact almost every day, I receive an email message, a letter, a telephone call, an inquiry from somebody saying, "I know that someplace in the Bible it says the lion will lie down with the lamb, but I can't find it! I've searched and searched and searched and I know that you must know where it is because the name of your ministry is Lamb and Lion and that's your logo. So, where is it?" The startling answer is no such verse exists, and people find this hard to believe. I had one guy that just would not accept that answer and he said to me, "I have received too many Christmas cards with pictures of lambs and lions for such a verse not to exist!" I guess this particular mythical verse ranks right up there with the one that supposedly says, "The Lord helps those who help themselves." Most people identify that as their favorite verse in the Bible and that's another verse that's not in the Bible. Now, the verse that people are looking for is this one — it's in Isaiah 11:6-7. "The wolf will lie down with the lamb and the leopard with the kid, and the calf and the young lion and the fatling together. Also the cow and the bear will graze and the lion will eat straw like the ox." 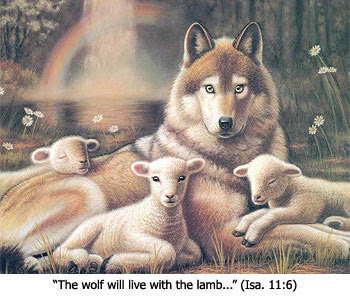 What Isaiah 11:6-7 says is that the wolf will lie down with the lamb. Something you very seldom hear and something you very seldom see. The wolf will lie down with the lamb because the wolf is the natural enemy of the lamb. But, don't be misled because there is absolutely no doubt whatsoever that the lamb and the lion will lie down together during the Lord's Millennial reign. They're going be living together because all of nature will be reconciled in peace. But, the Biblical reference is to the wolf and the lamb. I just guess the artist's have always found it more dramatic to picture the lamb and the lion together. Now, the name of our ministry — Lamb & Lion Ministries — has absolutely nothing to do with these verses in Isaiah 11. When I founded Lamb & Lion Ministries back in 1980 I sought a name that was related to the ministry's purpose which was the teaching of Bible prophecy and the proclamation of the soon return of Jesus. My first choice was this name Maranatha Ministries. I loved that name because in the Aramaic language "Maranatha" means "Oh Lord Come!" and that is the desire of my heart. And so, I selected that name and submitted it to the Secretary of State of Texas and found out that somebody else already had that name. So, I started praying for the Lord to give me a new and distinctive name, and that's when He laid Lamb & Lion Ministries on my heart. I liked the name because it points to the two great prophetic images of the Messiah in the Hebrew Scriptures. You see, the Messiah is pictured in the Hebrew Scriptures as the Suffering Lamb and as the Conquering Lion. As the Suffering Lamb it was prophesied that He would come and He would die for the sins of mankind. As the conquering lion, the image is that of the Second Coming when one day the Messiah would come in great wrath to pour out the wrath of God upon the enemies of God who are those who have rejected the grace, mercy, and love of God. The two images were so distinct that the Jewish sages concluded that there must be two Messiahs. And so, they named the suffering lamb "Messiah Ben Joseph" and they named the conquering lion "Messiah Ben David." They could not see and understand that the prophets were talking about one Messiah who would come twice, each time with a different purpose and a different role. In the next installment of "Jesus the Lamb and Lion," we will look at Jesus as the Suffering Lamb. not all of them. the teaching breaks down when you consider ch 21 mentions no more death...that does not describe the millineum. they also teach the 12 trees along the river is further description of ezekiel 40-42. their are simularities but it seems rev21-22 speak of the eternal state.